As Americans gather around Thanksgiving tables this year, giving has reached an all-time high of $390.1 billion, the seventh year in a row of increased giving. According to Giving USA, giving by individuals grew nearly 4%, driving the rise in total giving for 2016. "Notably," says GuideStar, "all nine major types of recipient charities experienced increases in giving as well, just the sixth time in the last four decades that this has occurred." The following is our annual selection of some of the many thoughtful and distinguished gifts people have made in our region, a reminder that it is individuals, those gathered around our tables, who create and sustain philanthropy. We share this list each year in our annual Thanksgiving card, and post online as well. 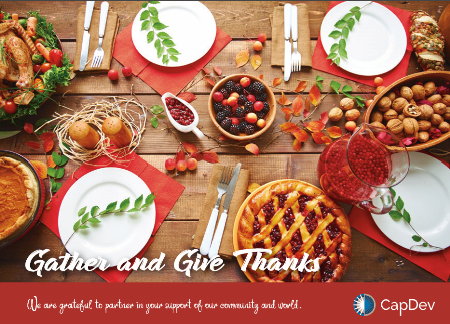 With all our best for your time to "Gather and Give Thanks" with those close to you, from your friends at CapDev.